file. Is there a copy I can download to replace it? The file would be for Ubuntu 12.04 (Final Beta) in the United States. This will open software-properties-gtk with no repository selected. Then change the server to Main server or to any other server of your choice. You must enable some repositories from the new window in order to create new sources.list file in /etc/apt/. Note 1: the word deb and deb-src refers to the repository format. deb is for binary package anddeb-src` is for source package. Note 2: Using # at the start of the line make that line a comment. Apt will ignore it so all repositories mentioned on that line will be disabled. Note 3: There are repository lines which includes all four components main, universe, restricted, multiverse. You can disable one or more of them by removing the word. 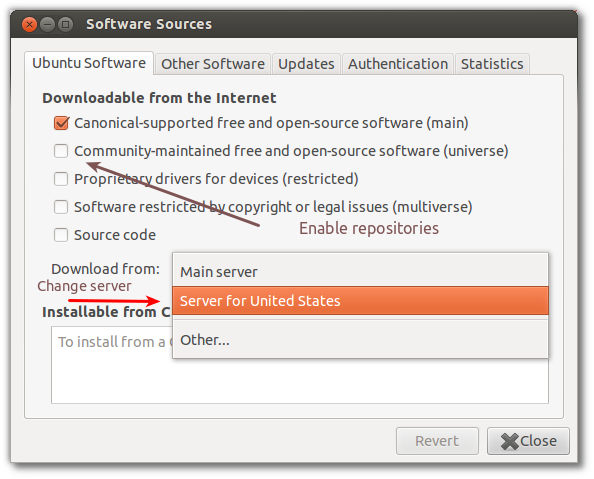 Select your Country and Ubuntu Release. For the default set of repositories, you need to enable these repositories. All of the Ubuntu Branches repositories. 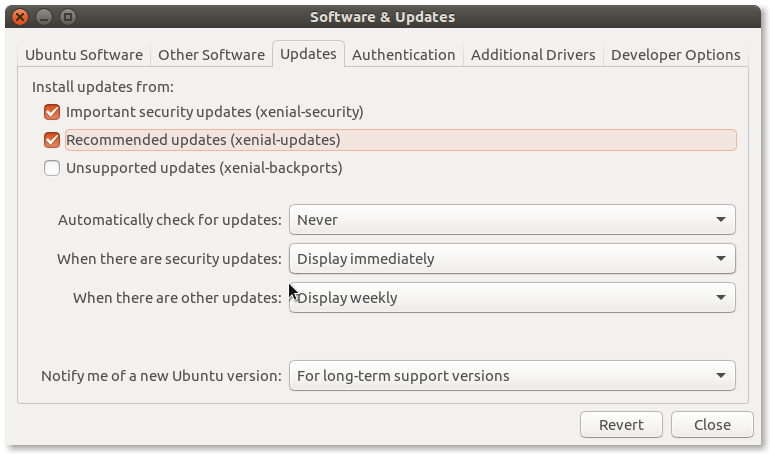 Security - Important Security Updates. If you want to install software from Canonical Partner Repositories (closed source software), enable the Ubuntu Partner Repositories (both of them). Enable any 3rd party repository you wish to enable. Copy/paste all the text from the newly generated sources.list to this file. Save it and close Gedit. This will update your repository index with the current sources.list and then you can install any software using Software Center, Synaptic or apt-get. By default there will be a backup for your sources.list file on the same directory itself. Not the answer you're looking for? Browse other questions tagged repository software-sources . How can I remove all PPA? Can someone provide a real, correct and genuine sources.list for Ubuntu 15.04? anyone know how to reset source.list? Upgrading to Ringtail 13.04 broke some APT repositories? remove 8.04 repositories in 12.04? How to install postgresql 9.1 on ubuntu 12.04 by adding repository?